Did you know that October is a very SPECIAL and IMPORTANT month because it is Non-GMO Month! Non-GMO Month was created by the Non-GMO Project in 2010 as a platform for raising awareness on the GMO issue. Citizens and organizations across North America are waking up to the failure of GMO technology, and discovering the risks GMOs pose to our health, our families, and our planet. Non-GMO Month is an opportunity to coordinate our voices and our actions, so that we can stand up loudly and clearly for our right to know what’s in our food, and to choose non-GMO. This is so important because GMO's have been shown to really harm our bodies!! Protecting consumer choice and a non-GMO food supply require a multi-faceted approach and lots of team work, which is why one of my new favorite organic and non-GMO cheese companies, Rumiano Cheese, is also helping bring awareness to the Non-GMO Project and celebrating Non-GMO month with their Second Annual Big Cheese Sweepstakes began on Oct 1 and will run until Oct 31. 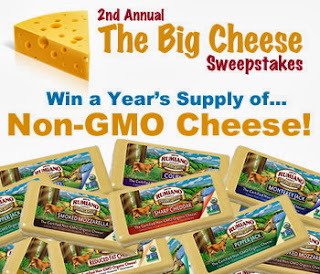 The winner could receive a year's supply of Non-GMO cheese! They also support Non-GMO Month by being the world's first Non-GMO Project Verified cheese. Their entire organic cheese line, organic butter, and organic WPC-80% are the first in the world to achieve Non-GMO Project Verification. They support the right for all consumers to make educated and informed decisions about whether or not to choose GMOs (genetically modified organisms). Besides being Non-GMO and organic, their cheese is YUMMY! 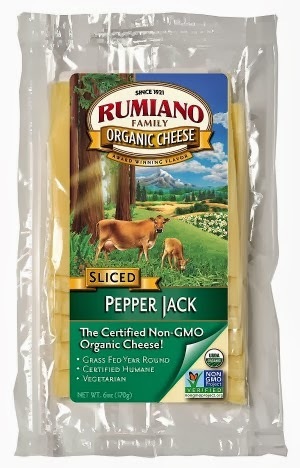 We tried some of their organic cheese slices the other day in a recipes and they were full of flavor and cheesy goodness! I feel great feeding my little cheese lovers Rumiano Cheese because of everything they stand for and everything they DON'T put in their cheese! Buy It: You can purchase Rumiano Cheese at select Whole Foods across the country and several natural product stores. To find a location near you, check out the Store Locator. 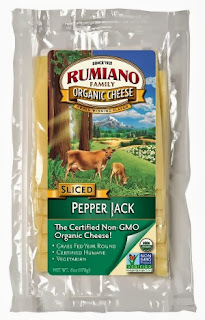 Win It: Rumiano Cheese is generously offering (5) Free Product Coupons to a lucky winner!